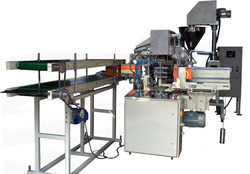 On the demand of our existing customers we have started manufacturing of Lined/ Mono Carton Packaging Machines. Efficiency and reliability are highly appreciated by our clients. The materials used to manufacture these products are sourced from trustworthy vendors. Simple operation and low maintenance are highly appreciated by our customers.Before the final delivery of these machines. Carton Packing Machine & sealing machine with auger filling system is suitable to pack spices, flours, detergent powder, protein powder, custard powder, milk powder, instant drink powder, gulab jamun mix & food premixes in Lined cartons. No. of station: 14 station. Packing range: 50 gm to 250 gm/ 200 gm to 500 gm. Electrical Motors: Crompton / Bonvario make. Contact Parts: SS- 304 make. In 14 station: Approx. 15- 25 cartons per minutes. 50 gm to 250 gm / 200 gm to 500 gm. 2 KW Servo motor (Delta make). Color touch screen (Delta make). Standard 440/220volt, Three phase, 50 Hz. SS 304 make. (Rust proof).